Features: Famous for ONLY 1 hand time! 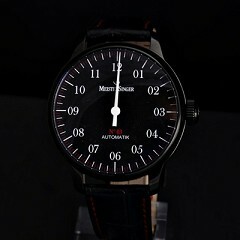 MeisterSinger Limited Editions SS Number 3 Single Hand Time! MeisterSinger has become synonymous with single-hand watches! Sapphire crystal, reverse display, automatic 25 jewel Swiss movement, 316L, Case material, stainless-steel, Case diameter 43 mm x 50 mm with lugs, single hand time, 50 meters, leather pouch, box & papers! 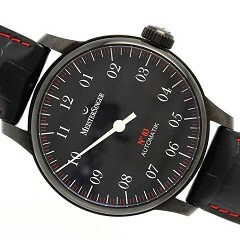 Limited Edition with Black PVC, Black Dial, Red model number plus Red minute markers & Red stitching on strap! Sell for $2,250 or TRADE!